Ruthiebear (Titusville, NJ, United States) on 10 June 2017 in Landscape & Rural. Looks like an old,friendly,vintage house. A real nice barn. A great shape, that brings out it's character. Superb image of the barn. Tout beau Ruth, un endroit magnifique! Bise, bon samedi dans la joie! Lovely natural colours, road leading to the barn. I like the way the fences lead us toward the barn. I like the picture of the barn too. Very good picture of its structure. Nice lead in lines and textures. I think a more panoramic crop would work well, as the blank sky adds little of interest to the picture. What do you think? @grouser: I think you are right and I will do that and see how it looks. thanks. Quel rendu quelle ferme et compo fantastique vue. 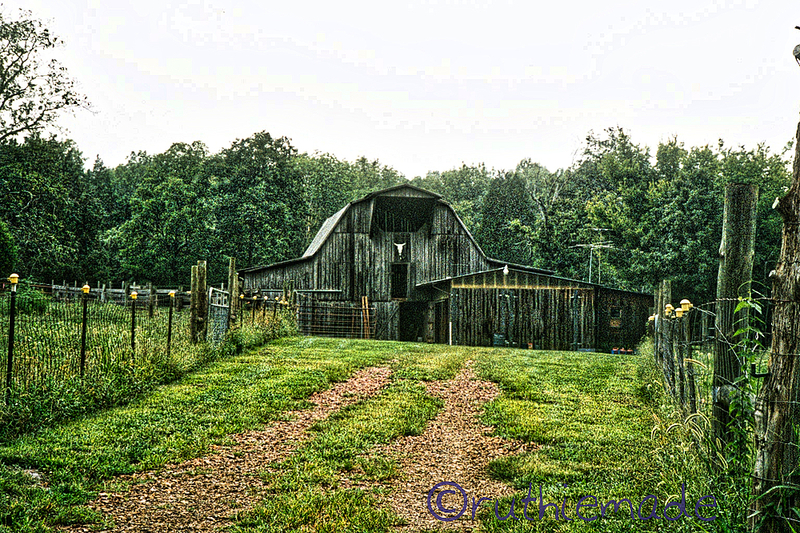 fine example of a well-used barn. The foliage and fences lead nicely to it, but the washed out sky seems to press it down. It looks like a bleached out 1960s shot. I really like that old barn. The wood is so weathered and beautiful. I like the grainy effect. It adds age to the image. Very nice ! Worth photographing, worth scanning !